The climate of the Sporades, Greek islands in the Aegean Sea, is Mediterranean, with relatively mild, rainy winters and hot, sunny summers. There are also some smaller islands such as Kyra Panagia, Peristera (or Aspro), Gioura, Skantzoura, Piperi and Tsougria. 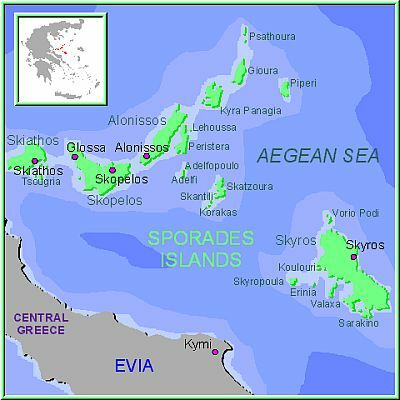 These islands are also called Northern Sporades, to distinguish them from the Eastern Sporades, which include Chios, Ikaria, Lesbos, Samos, and from the Southern Sporades, also called Dodecanese. Being a short distance from the mainland, in winter the Northern Sporades are subject to cold and windy periods, especially the most western, like Skiathos and Skopelos: sometimes even snow can fall. 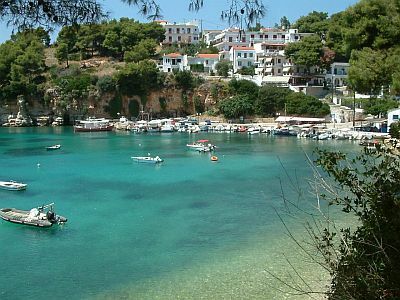 For example, here are the average temperatures of Skopelos. The rains follow the Mediterranean pattern, and are more frequent from October to April; in summer, the rains are rare, though occasionally there can be brief showers or thunderstorms coming from the continent. For example, here is the average rainfall in Skopelos. The amount of sunshine in the Sporades is excellent in summer, when clear skies prevail, and it is also good in May and September, while in the rest of the year it's not so high, since there are several cloudy periods. Here are the average daily sunshine hours in Skiathos. The temperature of the sea in the Sporades, still cold in May and cool in June, becomes high enough for swimming from July to September, when it reaches 23/24 °C (73/75 °F). Here, for example, is the sea temperature in Skyros. The best time to go to the Sporades Islands for a beach holiday is the summer, from June to mid-September. In June and September, and sometimes in early July, there can be some cool evenings, so it's best to bring a sweatshirt for the evening. Back to the Greek Islands.